The official Orange Wednesdays app is now available free from the iTunes Store. 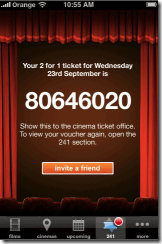 You don’t need to be on Orange to use the app’s basic functionality (showtimes, reviews and trailers), and customers of Orange’s mobile or broadband services can also obtain free 2-4-1 cinema ticket codes through the app. To prove that you’re an Orange customer, you need to enter either your broadband username or mobile number (unless you are using your iPhone on Orange, in which case this step isn’t necessary). If you go down the broadband route, Orange checks that you’ve entered a valid username. 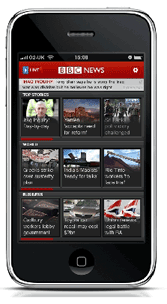 If you provide a mobile number on the Orange network, you will receive a text message with a unique PIN, which needs to be entered into the app to unlock the 2-4-1 functionality. This is great for me, as my iPhone is on O2 but I also have an Orange phone supplied by my employer, which is only switched on when I’m on call. Previously I had to send an SMS to the 241 number to get my code (at a cost of 35p) and take my work phone to the cinema. 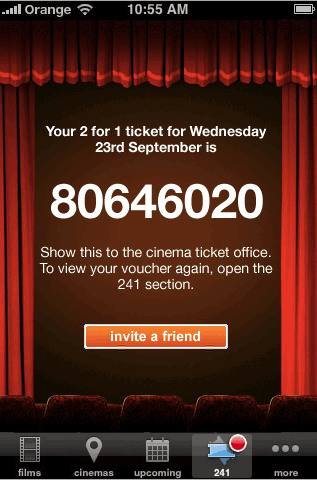 Now I can request Orange Wednesdays 2-4-1 codes without even needing to switch on my work phone. Result!